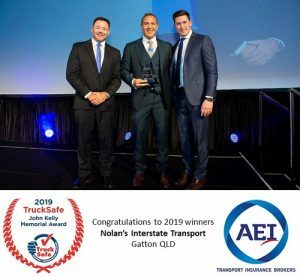 The TruckSafe John Kelly Memorial Award, which is awarded as part of the ATA’s National Trucking Industry Awards, will recognise a TruckSafe accredited operator that has successfully implemented the program and encouraged others to join TruckSafe. The award honours the late John Kelly, posthumous winner of the ATA Outstanding Contribution Award in 2008.
a reputation for integrity and ethical behaviour in trucking. at fault incident and accident reports.